Here’s a minigame that I made in 23 hours (including sleep, meals and distractions) at the recent OrcaJam in Victoria. I made it using a mini-framework in BlitzMax that I started coding in the week running up to the OrcaJam and extended more there. The OrcaJam was awesome, I met loads of great Indies, and some fantastic minigames came out of it. If you get a chance to do a gamejam, do it, it’ll teach you a lot! Yes the graphics are bad programmer art and the gameplay is very basic, but it is a complete game, and it feels good to be able to make one quickly. Now that my mini-framework is more complete, I could do it again in a few hours. – Use the arrow keys to avoid the rocks (grey squares). – Pickup a certain number of yellow squares to complete the level. 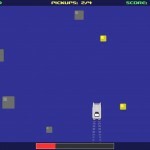 – The bigger the yellow square the more points you get, but watch out, your speedboat will also grow larger! – Each level requires you to collect more pickups, and you move faster, plus there are more rocks. – Have fun! See if you can survive at top speed! This entry was posted on Sunday, September 26th, 2010 at 6:50 pm and is filed under Minigames. You can follow any responses to this entry through the RSS 2.0 feed. Both comments and pings are currently closed.